Former Cape Town Mayor Patricia De Lille (file photo). The DA on Saturday has delayed announcing who its candidate will be in its most coveted province, the Western Cape. The announcement was set for Sunday morning, but a statement from the party said it would only happen next week. "Tomorrow's scheduled announcement of the DA's Western Cape Premier Candidate for the 2019 elections is postponed until later in the week, to be combined with the announcement of the successful candidate for the Mayoralty of the City of Cape Town. Further details will communicated in due course." Party leader Mmusi Maimane meanwhile announced the party's Limpopo Premier candidate on Saturday. "I am delighted to be in Masodi Village today to announce Jacques Smalle as the Democratic Alliance's Premier Candidate for the 2019 Election." Maimane said Smalle was one of the few that could pull off the job. "Few are as well qualified as Jacques to champion the DA's call for freedom, fairness, opportunity and diversity throughout Limpopo. As of now, he will champion the DA's charge for change and mission to unseat the incapable ANC government in the province." 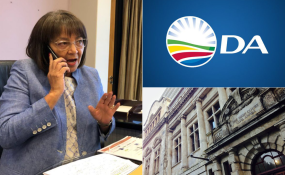 The DA is still recovering from a series of PR challenges, including a legal battle in the Western Cape High Court in June, over the party's decision to terminate Patricia de Lille's membership for comments she made during a radio interview. De Lille and the DA met in court earlier that month to argue the merits of her removal for comments she made during a Radio 702 interview on April 26. In May, the DA's federal executive announced that De Lille had breached one of the party's constitutional clauses when she said during the interview that she would "walk away" upon clearing her name of various allegations levelled against her. De Lille submitted her resignation in August, and in exchange the party withdrew all internal charges against her. A new Cape Town mayor is expected to be elected by the end of September. De Lille will leave her position at the end of October. News24 previously reported that several potential candidates have already stepped forward for the mayoral position.